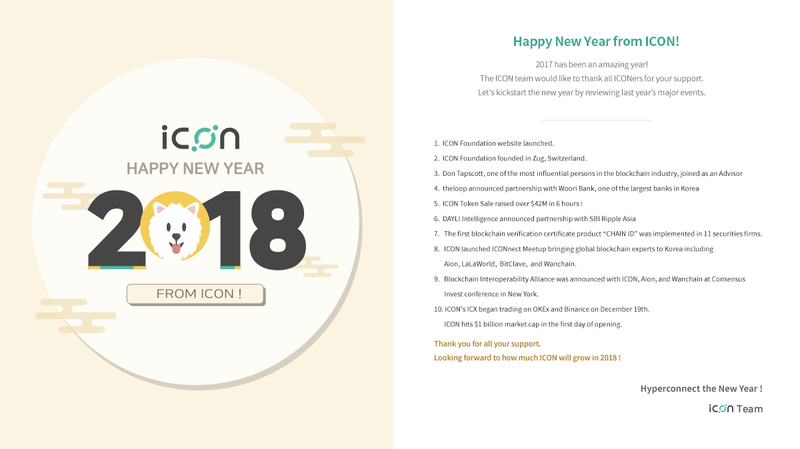 Happy New Year from ICON! 2017 has been an amazing year for ICON! The ICON team would especially like to thank all ICONers for your support. In order to kickstart the new year, let’s review last year’s major events. 1. ICON Foundation website launched. 2. ICON Foundation founded in Zug, Switzerland. 3. Don Tapscott, one of the most influential persons in the blockchain industry, joined as an Advisor. 4. theloop announced partnership with Woori Bank, one of the largest banks in Korea. 5. The ICON Token Sale raised over $42M in 6 hours! 7. The first blockchain verification certificate product “CHAIN ID” was implemented in 11 securities firms. 8. ICON launched ICONnect Meetup bringing global blockchain experts to Korea including Aion, LaLaWorld, BitClave, and Wanchain. 9. Blockchain Interoperability Alliance was announced with ICON, Aion, and Wanchain at Consensus Invest conference in New York. 10. ICON’s ICX began trading on OKEx and Binance on December 19th. ICON hits $1 billion market cap in the first day of opening. Thank you for all your support. Looking forward to how much ICON will grow in 2018! Founded in August 2017, the ICON Foundation oversees the ICON project's core activities which includes the promotion and development of the ICON protocol. ICON is one of the largest blockchain networks in the world. ICON boasts independent blockchains comprised of reputable institutions in major industries.